The sporting rivalry between the University of British Columbia and the University of Victoria dates back to the early part of last century. This season, that competition has been ramped up a notch with the introduction of the Legends Cup. The new trophy will be awarded to the university with the highest points total based on season long results between the two schools over six sports – soccer, basketball, cross country, field hockey, rowing, and rugby 15s. Each university will earn two points for a win and one point for a draw in their head-to-head events, with points tallied up over the season. The winning university will then receive the Legends Cup at their annual awards banquet, with the athletic director of the losing school making the award. 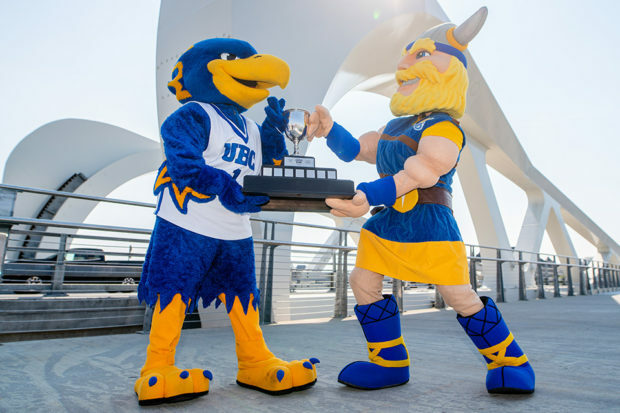 The series is already underway, with the women’s soccer teams kicking it off on September 1st, with the Thunderbirds coming away with a 1-0 win over the Vikes and securing two points for UBC. After other results in women’s rugby and women’s field hockey, UBC currently lead the standings by five points to three. The men now get in on the act on Thursday night when they take on Victoria at Thunderbird Stadium (with a 5.15pm kick off), before heading over to the island two days later for the rematch at Centennial Stadium on Saturday afternoon (where kick off is 2pm). The women also meet again this weekend on Friday night at Thunderbird Stadium. The men’s programs have had a fierce rivalry on the soccer field for many a year, and for Mike Mosher, who has been a part of the Thunderbirds program as both player and coach since the late 80’s, it gives his team’s pair of matches against the Vikes this year a little bit of an extra bite. “It’s a rivalry that goes back 30 plus years,” Mosher told AFTN. “I remember when I came into the program as a player, UVic were the rivals. It’s good to have that something a little bit extra to play for, but for us, it’s game by game, team by team. The Thunderbirds will be looking to continue their unbeaten start to the new college season, ahead of the Nationals in November, which UBC will be hosting for the first time since 2007. They’ve recorded eight wins and two draws from their first ten matches, the latest of which was a 7-0 trouncing of UNBC on Sunday afternoon. But while the Thunderbirds are perched pretty at the top of the Canada West Pacific Division standings, the Vikes are fighting for their playoff lives, currently sitting outside the four playoffs place available with a 3-4-3 record. It all adds up to this weekend’s pair of matches being a couple of crackers and highly competitive affairs. Get out and see them if you can.